JOHN BENJAMIN, 1598-1645, from Bristol, Eng., in the ship "Lion," 1632, settled at Cambridge, Mass. Arms — Or, on a saltire quarterly, pierced sable five annulets counterchanged. Or, on a saltire quarterly, pierced sable five annulets counterchanged. CREST — On a chapeau, a flame of fire, all ppr. Arms--Sable, three old men's head couped at the shoulders argent, crined proper. Crest--A cross-crosslet fitchée sable, and a dagger argent, hilt or, in saltire. 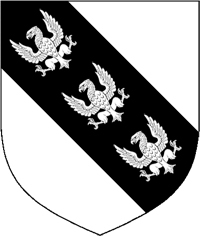 Argent, three bars nebulée gules, in chief as many torteaux. CREST -- Out of a mural crown, a demi-horse argent, maned or, collared gules, studded of the first. JOHN EMERY, of Romsey, Hampshire, England, to Newbury, Mass., 1635. Arms -- Argent, three bars nebuleé gules, in chief as many torteaux. Azure, two bars or; in chief a cross formée fitchée of the last. CREST -- A squirrel sejant or, holding a hazel-branch, slipped and fructed; all ppr. Argent, between two palets gules, three fleurs-de-lis in pale sable, a chief azure. CREST — On a chapeau a pelican vulning herself ppr. Argent, on a fesse gules between three cinquefoils azure, a hind passant between two pheons or. THOMAS LORD, b 1585, came to New England, 1635, probably from Sudbury, Co. Suffolk, England. Arms — Argent, on a fesse gules, between three cinquefoils azure, a hind passant betw. two pheons or. Lord Arg on a fess gu bet 3 cinquefoils az a hind pass bet 2 pheons or. Crest: a demi-bird with wings expanded sa. On its head 2 small horns or. The dexter wing gu lined arg. The sinister wing arg lined gu. JAMES OLMSTEAD, b. 1580, of New Eng., 1632, son of James Olmsted of Leighs Magna, Essex, Eng. Arms — Sable, a pheon between three cresents argent. Arms -- Vairé, argent and sable, on a canton gules a lion passant guardant or. Bolton, Charles Knowles. 1927. Bolton's American Armory: a Record of Coats of Arms Which Have Been in Use within the Present Bounds of the United States. 2nd. ed. F.W. Faxon, Boston, MA (1964, Heraldic Book Co., Baltimore, MD; Broderbund CD-368). Crozier, William Armstrong Crozier. 1904. Crozier's General Armory: a Registry of American Families Entitled to Coat Armor. Fox, Duffield, & Co., New York (1957, Southern Book Co., Baltimore, MD; Broderbund CD-368). Matthews, John. 1991a. Complete American Armoury and Blue Book, combining 1903, 1907 and 1911-13 Editions. Clearfield/Genealogical Publ. Co., Baltimore, MD (Broderbund CD-368). ______________. 1991b. Complete American Armoury and Blue Book, combining 1903, 1907 and 1911-13 Editions. Part II, Armorial Addenda. Clearfield/Genealogical Publ. Co., Baltimore, MD (Broderbund CD-368). ______________. 1991c. Complete American Armoury and Blue Book, combining 1903, 1907 and 1911-13 Editions. Part IV, 1911-23 edition. Clearfield/Genealogical Publ. Co., Baltimore, MD (Broderbund CD-368).